“This is Question Period material," snapped B.C. NDP MLA Scott Fraser. By the summer of 2014, in an historic decision by the Supreme Court of Canada, the Tsilhqot’in were granted Title to 1,700 square kilometres of ancestral lands including areas near Chilko Lake where the province issued grizzly hunting licences. Following, the Tsilhoqot’in and the Province entered in an interim agreement to allow registered guides to continue their wildlife hunt for the 2015 season, but not for grizzlies and not on Title lands, says Chief William. Who tripled the grizzly hunt? Then somehow, the number of grizzly licences tripled in the politically sensitive Tsilhqot’in lands. Forestry, Lands and Natural Resources staff said Minister Thompson was not involved. "Minister Thomson is not responsible for issuing authorizations. Ministry biologists determine the number of authorizations to be issued based on five year allowable annual harvest, and success rates,” wrote ministry spokesperson Greig Bethel. A FOI released ministerial briefing note says the total number of grizzlies used to justify the hunt, was actually a hunch. "These [bear] estimates are derived from modelling and professional opinion. There have been no DNA or other inventory studies conducted in this area,” Minister Thomson was told in a briefing note. "With regard to the decision to re-open the Chilcotin to a limited entry hunt in 2014, my decision was based on the best available science. The hunts were re-opened because grizzly population information and trends indicated that a limited hunt was sustainable." "First Nations food, social, and ceremonial rights are provided for prior to any issuance of opportunities for either resident hunters or guide outfitters,” said Thomson. Green Party MLA, Andrew Weaver, said the Liberals are too closely aligned with guide outfitters. B.C. grizzly bear. Photo by Andrew Wright. “This government has an agenda, come hell or high water, and that agenda is catering to their vested interests. And guide outfitters are in their good books right now,” said Weaver. “They think they’re invincible," he added. Coastal First Nations leader Art Sterritt has mused about taking the province to court to end the trophy hunt among the tidal tribes he represents. “We agree with the Tsilhqot’in that this hunt is illegal. It’s contrary to [Aboriginal] culture." “Our preferred route is not to go to court. It’s to negotiate a settlement, and that’s where we’re at now,” said Sterritt. Minister Thomson was told in briefing notes that of the 185 public comments regarding the proposed Cariboo Chilcotin hunt, 170 were opposed (or 92 per cent against). 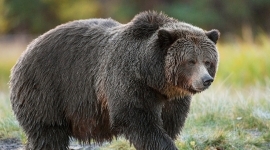 That mirrors recent province-wide polling, paid for by Coastal First Nations, showing 75 percent of British Columbians oppose the sport killing of grizzlies. The Guide Outfitters Association of B.C. said it was supportive of a recent Green Party legislative proposal to require meat removal from a grizzly hunting kill site. In October 2014, Premier Clark apologized for the hanging of six Tsilhqot’in war chiefs, on the 150th anniversary of their deaths. Negotiations for the transfer of provincial royalties and responsibilities for Tsilhqot’in’s new title lands are ongoing.